Our Recent Trip to China! 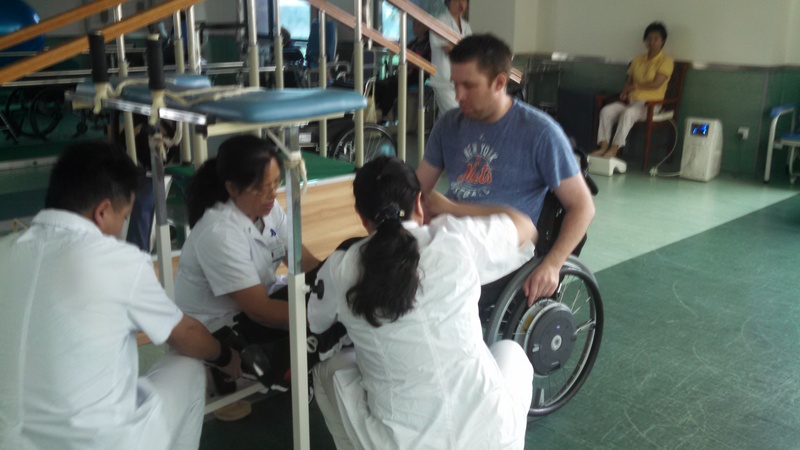 Darren & I spent 5 days recently at the Kunming Tongren Hospital in Kunming, China to check out their “Walking Program.” The idea was to see what the program is all about, and meet the Doctors and other people participating in the program. Darren is between jobs at the moment (his own choice) and wants to dedicate a period of time to intensive exercise. After researching this option and speaking to Dr. Wise Young, he thought this was a viable idea for concentrating on rehab and exercise. Dr. Young put us in touch with the Hospital and Emma, their English speaking coordinator (thank goodness for Emma’s assistance!) helped us make arrangements. From arranging to stay at the hospital for the week, getting transportation to and from the airport, providing documents for our Visas and more, Emma was a great help! With great anticipation and months of planning, we left the US on Friday, July 25. With a slight delay in Beijing and arriving to find they have no transfer or aisle chair in the Kunming airport (ugh), and then a very interesting ambulance ride to the hospital, we arrived late on Saturday night. One of the other patient’s father, Eric, was anxious to meet us, and welcomed us to Kunming! Eric was able to give us a lot of helpful information that evening, and it was great to know someone (especially someone who spoke English!) right away. While I have many stories and experiences to share about our 5 days in Kunming, I will stick to the Walking Program itself for this blogpost. I’ll write more in future posts, I promise! Patients in the program go to the gym for 6 hours each day. It reminded me of traditional physical therapy here in the states, with therapists working with multiple patients at one time. I couldn’t really figure out a “schedule” of who did what and when, and with what trainer/therapist, but it seemed to flow rather seamlessly. The term “organized chaos” comes to mind, but it was not chaotic in any sense. Perhaps there was a plan that I didn’t know of. But no one seemed to know, or really mind, for that matter. On their own, people were doing OT type of hand exercises for fine motor skills using pegs and boards, would use a Vitaglide machine or ride one of the MotoMed bikes. Mat exercises were sometimes done independently, or with an assistant, therapist or family member/caregiver. I also observed many patients receiving acupuncture throughout the day. There were also people walking with the high walkers pictured here. For some patients, this is the most labor intensive exercise, although there were some people walking on their own with just a family member following behind with the wheelchair. These independent walkers did a lot more walking than those needing multiple helpers. The gym was set up in a U shaped design, overlooking the floor below and with ample windows and natural light. The walking area was very wide and had a smooth linoleum type floor. The walkers are very basic and a variety of hand grips, leg straps and knee braces are used. The actual amount of walking that a person does during the day varies, but seemed to be about 2 hours total, at the most, for anyone needing assistance. That was broken up into multiple sessions. Granted, it is very labor intensive and demanding on the staff members to assist with walking the way they perform it. But we really thought more walking was taking place each day. According to some of the patients we met, it seems like more walking took place previously, but not lately due to decreased staffing. This was disappointing to us, as Darren was really looking for an intense walking program. Our week in Kunming was enjoyable and informative. We were really glad we went to see for ourselves what the program actually is. We met some incredibly smart, friendly and entertaining people, which made the week fun. Thanks to David and Eric Wishart for providing us with delicious meals and entertainment during our visit! In summary, Darren feels he can set up a program at Push to Walk that gives him the benefits he is looking for. I will write more on that in the future, as well as some other stories and experiences from our trip. Stay tuned for details! Yay, a day without snow! With record snowfalls in northern NJ this year, everyone I know is looking forward to spring. We all hate the shoveling, clearing our cars, and navigating through parking lots and sidewalks. But if you know someone who uses a wheelchair or has difficulty walking, what an added element of difficulty snow adds to a daily routine. As I make my way carefully over slippery surfaces, up and over snowbanks, or around obstacles to get where I’m going, I think about everyone who relies on their wheelchairs for mobility or have difficulty with balance and taking smooth steps. HOW do you do it? From very narrow walkways to uncleared access ramps, snowed-in parking spaces to icy surfaces – it can be a nightmare, I am sure. And how do you clear off your car, or dig out after being plowed in? Other than moving to a warmer climate, what are your solutions and tips for others who might be facing similar situations? I’d love to hear your ideas, and pass them along to others! Until the next snowstorm (although I know the snow we already have will cause problems for months), stay safe! Darren and Push to Walk Featured on CNN! I am so excited to pass along this link! A video about my son Darren’s story and the reason we founded Push to Walk was recently produced and is featured on CNN.com. Check it out! Many thanks to our Board Chairman Ralph Rathyen for initiating contact with Sarah Galus Esteves at CNN and her commitment to bring it through the process for story development. Thank you to Sarah, Holly Firfer and the entire team for bringing our story to the public! Please share with others through email, Facebook, etc. Help us spread the word! This is a great write-up from a new client. There is no way I could describe the experience of coming to Push to Walk like he has!